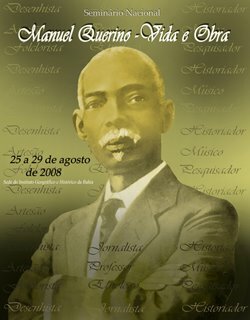 A seminar on "Manuel Querino: Life and Works," hosted by the Geographic and Historic Institute of Bahia (IGHB) and organised by Jaime Nascimento, will commemorate two milestones - the 157th anniversary of the birth and 85th anniversary of the death of Manuel Raimundo Querino. 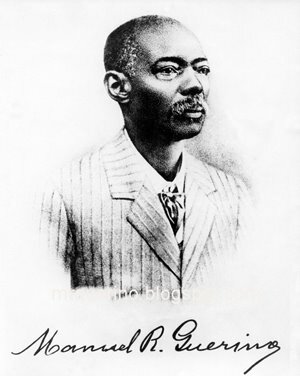 An author, jousnalist, historian, teacher at the Liceu de Artes e Ofícios and São Joaquim Orphanage School, a self-taught anthropologist and one of the most important scholars of the History of Bahia, Querino pioneered the study of the African contribution to the development of Brazilian society. This unique and multifaceted figure will be discussed and analysed, while underscoring his importance to the intellectual worlds of Bahia and Brazil. The seminar will be held from July 28 to August 1, 2008, including presentations at the IGHB Auditorium and the Anísio Teixeira Intitute's Teleconference Room.